Let others feel happy as you deliver them this Breathtaking Arrangement of Chocolates and Teddy with your love and affection. 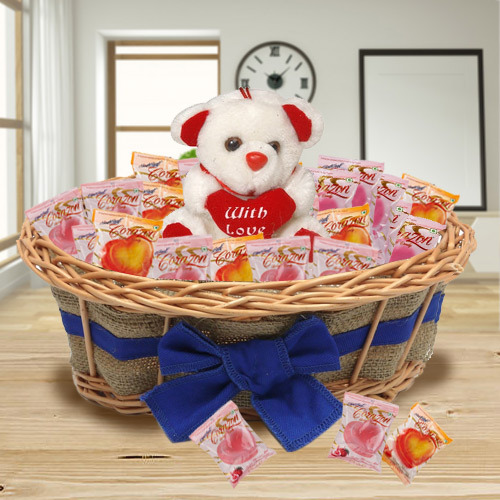 This splendid Assortment of Gifts include 150Gms Strawberry Flavoured Corazon Chocolates and a 6" Cute Teddy in a Basket. Flowers Delivery Vadodara, Send sweets Kozhikode, Wedding Cake Tellicherri, Diwali Mithai Thrissur, Send Flowers and Gifts to Miraz, Online Shop Kakinada, Flower to Krishnagiri, New Year Flowers Khanna , Fresh Fruits Goa, Send Gift Kapurthala, Dry Fruits to Vijayawada, Birthday Delivery Barrackpore, Sending to Kakinada, Flower shop Sivakashi, Krishnagiri Online Cake Delivery.